Sándor Szabó......guitar artist, composer, sound designer,independent musicologist, auther . 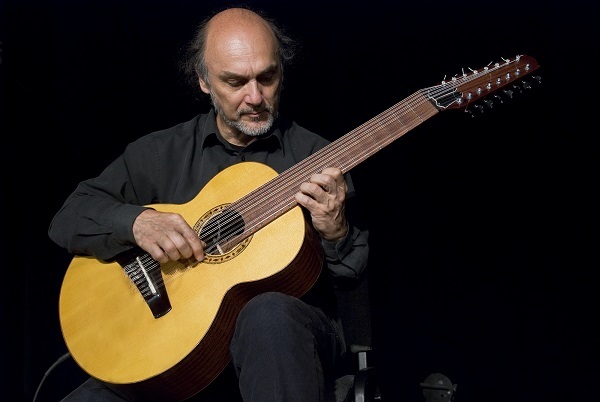 Born in 1956 in Törökszentmiklós, Hungary, he started his studies with a private teacher of classical guitar. After trying different styles from the middle of the seventies, he began to focus on improvisation and composition. His career started in 1980. From the beginning of his carreer he belongs to the exotic players and composers. In his compositions he blends the Far-Eastern music with the Hungarian folk traditions in an improvised context. He plays all kind of guitars, ouds, guzheng,esraj. He soon became known internationally with his original style, modern pieces, and deep spirituality. His music can be heard on more than 60 records, which has been released in England, USA, Italy, Germany, Venezuela, Norway and Hungary. In 2012 he has published his first book in Hungary titled The Metaphysics Of The Music. In2010 he finished his monumental composition called Hungarian Guitar Raphsody. This the very firstand only Hungarian guitar music so far which based on Hungarian traditional songs and dances. Withhis exotic Hungarian repertoare he became an important figure of the international guitar scene.In 2015 he published his second book called The Musicmaker Ancient East.Sándor Szabó took part on the Sharq Taronalari festival in 2013 and 2015 as an independent musicresearcher representing Hungary. He was also invited to Oriental Music Conference in 2014 to Baku,Azerbajan.